Ankle injuries are more common in winter months when trips, slips and falls increase due to icy footpaths. Twisted or rolled ankles are the most frequently treated ankle condition in clinic. Uneven footpaths, icy conditions and previous ankle injuries are all factors that can increase the likelihood of ankle injury. When we twist (known as an inversion injury) our ankle we generally injure one or more of the three lateral ligaments. The anterior talo-fibular ligament (ATFL) is the most commonly injured of these. 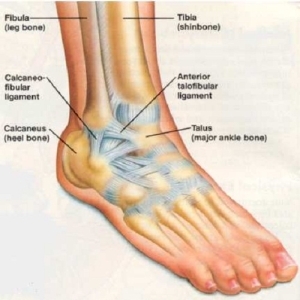 The calcaneofibular ligament or the posterior talo-fibular ligament (PTFL) are the other two ligaments that make up the lateral three ankle ligament complex. Tears or sprains of either of these two in conjunction with the ATFL are indicative of more serious ankle ligament injury. More serious inversion injuries may involve bruising of the talus – a bone that forms the ankle joint along with the tibia and fibula. Bony bruising of the talus can take a long time to settle and requires significant rest periods of up to 12 weeks to fully settle. More serious injury still, may involve syndesmosis injury. The syndesmosis is the connective tissue joining the tibia and fibula. Injury to this may result in a chronically unstable ankle. While bad ankle ligament sprain leaves you feeling very unstable, the modern treatment approach, in the absence of bony injury, is to avoid immobilization. Previously heavy bandaging was used but is thought to restrict movement excessively and prolong recovery. Rather gentle movement is encouraged as soon as possible and full weight bearing as it feels comfortable. Unfortunately, ankle injuries have a tendency to re-occur if care is not take to rehab properly. Stretching, strengthening and proprioception and balance re-training are all crucial components to the effective rehabilitation of the ankle ligament. The timing of return to sport or activity is also important and needs to be judged carefully. 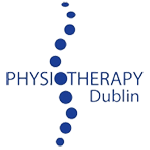 For assistance with judging your return to activity or with any aspects of rehab for your ankle injury just get in contact with us at the clinic 01 8249585 and we’ll give you some sound advice and have you back to training in no time.